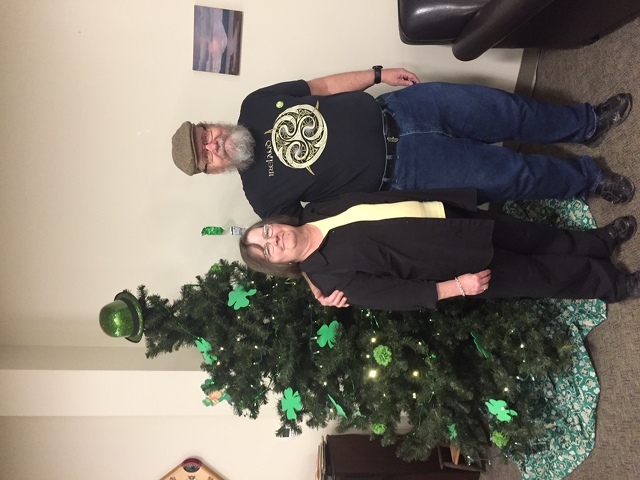 Groom-to-be Doug Mason and bride-to-be Sonja Ghaner pose in front of the St. Patrick’s Day Tree at the Centre Region Senior Center. The couple met at the center's Fraser Street location in 2015. Their wedding will be held at the center’s new Nittany Mall location. “He finally noticed me, though,” said bride-to-be Sonja Ghaner, laughing. The couple met at the Centre Region Senior Center in 2015, when it was located on Fraser Street in State College. They felt it was only right to hold their wedding at the center, which is now located in the Nittany Mall. They chose a maroon and cream theme for their wedding, which will take place at 10 a.m. Wednesday, June 6, the anniversary of Mason's proposal. The Rev. Carol Thomas Cissel, of the Unitarian Universalist Fellowship, will officiate. The Second Winds will provide the music for the event, along with Chip Coggins on piano. Ghaner has chosen Cindy Stahlman, supervisor of the senior center, as her attendant. The groom has chosen a friend, Bill Campbell, to be his witness. Mason is a retired soil scientist who has worked for state, federal and private companies, as well as nonprofits. He spends a lot of time doing work for the Sierra Club and is on the executive committee of the Moshannon Club. Ghaner spent many years as a homemaker and 10 years working for a daycare center. She now volunteers at the senior center's kitchen. Ghaner said she had been a widow for 10 years. She has four children and eight grandchildren and all are nearby. Mason has two children from a previous marriage, three grandchildren and one 5-year-old great-granddaughter. He hopes his twin sister and three brothers, all in New Jersey, will be able to attend the wedding, along with two grandchildren from Virginia. Ghaner and Mason, who ride the Centre County van to the senior center every day, also are inviting all the people they see daily at the center. Connie Cousins covers Centre County for the Gazette.